Extending the idea of what's possible - a rebuttal to Margaret Thatcher's "There is no alternative". The nearly two month absence in blogging is the biggest gulf since I started this activity some years ago. I think my small handful of regular readers probably appreciated the break. I have certainly been reading and thinking but not much has jelled into anything approaching coherence in my mind. Maybe I have never been coherent to the readers. I'm trying to understand why the notion to write arrives so irregularly, why The Muse avoids me amidst so much stimulation. But here I am, trying to find a series of words worth sharing, worth someone else's time to peruse and ponder. What makes any of us think we have something so useful to share? There are so many great thinkers who have taken the time to capture thoughts and organize them and publish them over the centuries. Our libraries are full of them. 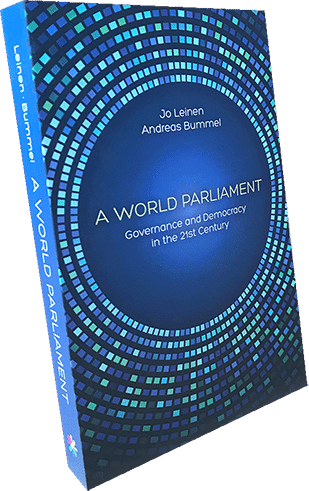 My most recently read book is a prime example, World Parliament: Government and Democracy in the 21st Century, Jo Leinen and Andreas Bummel (Democracy Without Borders, 2018) is, as international law scholar Richard Falk notes, a seminal work. 400 pages of in-depth reading, thinking and organizing of the history of the idea of world parliament and its ebbs and flows to the current day. Supported with more than 1,000 footnotes, many I have highlighted to peruse as I get a chance (I picked up four books from the library today from those notes). Reading a book like this makes one really appreciate dedicated scholarship and care for the subject. The tone of writing, at least as translated so nicely into English by is welcoming. No stridency, but truly a search for wisdom that might help us figure our way forward together. The authors offer no magic bullet, but they do offer some possible trajectories that give me, at least, a measure of hope. Hope that as a human family we can come together to wrestle with our globally shared problems (see for example the 17 Sustainable Development Goals the 193 member states of the UN have agreed to). As I sit here tonight composing this brief foray into the current human condition, I recognize that the once bright shining light on a hill that America was supposed to be, or what the great American poet Langston Hughes hoped America could be "Let America Be America Again", it is not. In fact we are the biggest problem facing the human family. I say this because we have effectively given ourselves a coronation as almost divinely inspired leader of the world = American Exceptionalism. We certainly were not democratically elected as such. While founded on the principles of democracy for some (not women nor blacks) we don't consider that democracy should be applied globally. We frequently take exception to any international legal agreements that the bulk of humanity agrees. Heck, we even back out of agreements - see Paris Climate Accord, Iran Nuclear Agreement, etc. And, of course, we guaranteed ourselves a veto in all decisions of the UN Security Council,an exceptional device we were forced to share with a few other WWII victor states. Militarily we have bases and troops stationed around the world pouring more money into military industrial complex than the next seven nations combined. If one of "our enemies" was to have a military base or floating warship as close to the US mainland as we are to many nations of the world we would throw a major hissy fit. History doesn't bode well for those who try and run a dominant empire for long. In pursuit of our myth of exceptionalism we have released more carbon, created more income inequality, and more social distress, while a select few prosper regally. As a young boy I remember learning about virtues. For some reason the one that always stood out for me was "wisdom". I figured if one had wisdom, one would naturally use all the other virtues in a balanced way. I have no real firm grasp of how one acquires wisdom. Some suggest that it comes with age or experience in the world. But, of course there is no guarantee. Some suggest that study will get us there, but that will likely only get us additional knowledge. And knowledge is not wisdom. Bernie Sanders explained this distinction well in debates with Hillary Clinton, where he noted she indeed had strong knowledge, but faulted her on her 'judgment'. Judgment is a key component of wisdom. A world legal system with a world parliament will not come about simply because it is ethically and morally superior to the present system of international law and because in any rational debate it has the more persuasive arguments. That may be a good starting position, but in and of itself it is of course not sufficient. The internal law expert Richard Falk has pointed out that '[i]n world order studies it is traditional to propose a better system of world order and then argue for its adoption. Such an approach tends to be "utopian" or "romantic" in the sense that it overlooks the transition from "here" to "there."' It was assumed that the better arguments would prevail. However, this dispute will not be settled in the debating clubs but in the political arena. 'Those who benefit from existing arrangements of power and interest', writes Falk, 'are unlikely to be swayed, except in marginal or cosmetic respects, by appeals based upon argument or values.' He argued that power can only be transformed only by countervailing power. 'No world order solution which presupposes the substantial modification of the state system can be achieved unless the advocates of the new system are aligned with important social and political forces within the existing world structure." My hope is that we are wise enough to understand this before it is too late. The authors report that in world wide surveys as many as 72% of our fellow earthlings consider themselves "citizens of the world." Once the US citizenry can get beyond our self-appointed exceptionalism and truly commit to a global democratic system we may have a chance. But if we are to be successful in time, we better start pushing now.